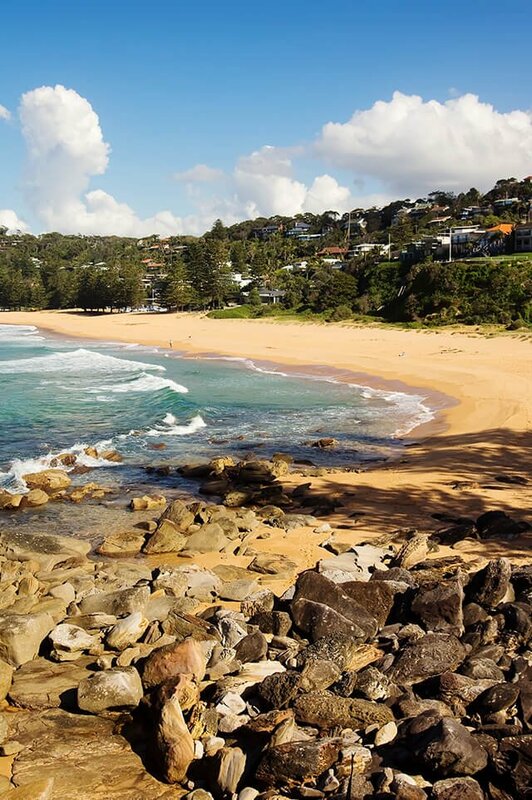 Whale Beach is located in a quiet, secluded pocket between Palm Beach and Avalon and lies approximately 40 kilometres north of the Sydney CBD. As a luxury suburb and not immediately accessible from the main route of Barrenjoey Road, ‘Whaley’ which is what it is known as to the locals is reached by car or a local bus route from Avalon. At the northern end of the beach, just off the rocks, there is a well-known surf break called the Wedge, where you might even catch a glimpse of legendary surfer Tom Carroll catching a wave or two. Alternatively indulging with the rich and famous at nearby Jonah’s restaurant with its commanding views across the Pacific Ocean. Whale beach is a residential, hillside suburb made up of freestanding properties, majority with ocean views centring down to a level sandy beach attracting predominantly mature couples or retirees. Whale Beach is within a 25-minute drive to the local Mona Vale Hospital and a one-hour bus ride to a selection of Sydney’s Universities in the CBD. The government school catchment zones are Avalon Public School and the secondary option is Barrenjoey High School. Do you need a Buyer’s Agent who can assist you to purchase a property in Whale Beach?